WASHINGTON (Reuters) - The United States imposed sanctions on Thursday on two Chinese shipping companies it says helped North Korea evade U.S. and international sanctions over its nuclear weapons program, the first such steps since U.S. President Donald Trump and North Korean leader Kim Jong Un's summit collapsed last month. The U.S. Treasury Department also issued an updated advisory that listed 67 vessels that it said had engaged in illicit transfers of refined petroleum with North Korean tankers or were believed to have exported North Korean coal. The department identified the newly sanctioned firms as Dalian Haibo International Freight Co Ltd and Liaoning Danxing International Forwarding Co Ltd, both based in China. The move prohibits U.S. dealings with the designated companies and freezes any assets they have in the United States. Washington announced the measures three weeks after a second meeting between Trump and Kim broke down over conflicting demands by North Korea for relief from sanctions and from the U.S. side for North Korea to give up its nuclear weapons. The United States has led international efforts to press North Korea through sanctions to give up its nuclear and ballistic missile programs. "The United States and our like-minded partners remain committed to achieving the final, fully verified denuclearization of North Korea and believe that the full implementation of North Korea-related U.N. Security Council resolutions is crucial to a successful outcome," Treasury Secretary Steven Mnuchin said in a statement. The latest sanctions showed there was some “leakage” in North Korea sanctions enforcement by China, but Beijing was mostly abiding by U.N. resolutions, a senior U.S. official told reporters, speaking on condition of anonymity. 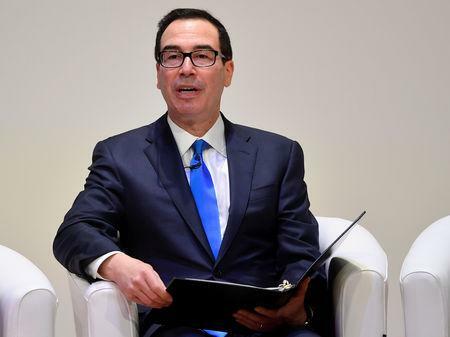 The official said that financial as well as shipping companies risked U.S. action if they were found to be in violation of sanctions. The official insisted, however, that Thursday's announcement was meant to maintain sanctions enforcement on North Korea rather than intensify the pressure. While declining to say whether Washington was trying to send a post-summit message to Pyongyang, the official said Trump "has made clear that the door is wide open to continuing the dialogue with North Korea." U.S.-North Korean engagement has appeared to be in limbo since the Feb. 27-28 summit in Hanoi, despite U.S. Secretary of State Mike Pompeo saying on March 4 he was hopeful he could send a team to North Korea "in the next couple of weeks." Washington has said it aims to re-engage with Kim, but North Korea has warned it is considering suspending talks and may rethink a freeze on missile and nuclear tests in place since 2017 unless Washington makes concessions. On Monday, two senior U.S. senators called for the Trump administration to correct a slowing pace of American sanctions designations on North Korea, saying there had been a marked decline in such actions during the past year of U.S. diplomatic engagement with Pyongyang. They pointed to a 2019 U.N. report that found that North Korea continued to defy U.N. sanctions with an increase in smuggling of petroleum products and coal and violation of bans on arms sales. The Treasury statement said Dalian Haibo was targeted for dealings with Paeksol Trading Corp, a company previously designated by U.S. sanctions on North Korea. It said Dalian Haibo shipped cargo from Dalian, China, to Paeksol in Nampo, North Korea, in early 2018 aboard North Korean-flagged vessels. The statement said Liaoning Danxing had "routinely used deceptive practices" to enable the work of North Korean procurement officials based in the European Union. The Treasury statement said evasion tactics employed by North Korea included disabling or manipulating automated identification systems, physically altering vessels, transferring cargoes between ships and falsifying cargo documentation. It said ports visited by vessels involved in ship-to-ship transfers included those in Taiwan, China, Russia and South Korea. The Treasury Department said that in 2018, North Korean ports received at least 263 tanker deliveries of refined petroleum via U.N.-prohibited ship-to-ship transfers. It said that if the tankers were fully laden, North Korea would have imported 3.78 million barrels - more than 7-1/2 times the 500,000 barrels a year allowed under a U.N. resolution. Biogen (BIIB) to Report Q1 Earnings: What's in the Cards?